Recently I was handed a new ride at work that has an input for my smartphone which enables me to listen to Pandora Radio all day long. One of the stations I listen to allot plays selections from this guy named Buckethead and everytime one of his tunes comes on I have to check to see who the heck it is making this hauntingly wonderful sound. Here’s another tune that showcases his ability to shred, yet has a distinct delicate feel to it as it starts. And hey all you Ft. Wayne Bonamassa video fans…….this one has dancers too! Yippee! I really like this guy……. bucket and all! « I saw Joe Bonamassa Friday Night………. I do not even pretend to ‘get’ this dude. First time I ever heard of him, Axel was going to tour with him as a “Guns ‘N Roses” thing, I think. I’ve seen him play of a couple of really odd gigs, but at this point, he’s more of an ‘Unknown Comic’ with a paper bag over his head. I figure he’s either got deep, troubling issues or he’s Carlos Santana in disguise. . .or The Predator! When Rose brought him out at some point in the past, I even thought he might be a player under contract with another label and thus, the get-up. His ‘look’ is so distracting to me that I have to really focus on what he plays to enjoy it at all. I don’t know if you saw Jethro Tull’s tour for “Aqua Lung.” His bass player was dressed in some kind of white and black polka dot, zip-up clown suit just like “Zippy’ wears and a pair of huge white sunglasses. For the entire show, this dude would start by standing in front of his bass cabinet and then go into a weird three-steps forward and bend a knee, stand back up, walk backwards three steps and start all over. The same pattern, the same steps, the same rythym to his little walk, no matter what the song or tempo was, fast or slow, rock or waltz. And it could be totally out of synch with his bass playing opn any given tune, like rubbing your tummy and patting your head. And, sure, it was creative and a bit of a spectacle and just weird enough for an old Jethro Tull show. It was also distracting and bit disruptive and I truly remember it as a negative, overall. I think you might be on to something with the “deep, troubling issues” comment. While perusing his wiki page there was some mention of taking some time off to deal with issues or something like that. There’s also a less than flattering quote from Axl on Buckethead’s departure from the band. The get-up was a major distraction for me too but his music resonates with moi, especially when hearing it on Pandora where the whole bucket thing is hidden. Maybe the mask is hiding some form of disfigurement and he is just taking that one step further into the department of weird. I believe he hails from Berkeley or somewhere in the Bay Area. Like I said in the title of this thread, the “mysterious” Buckethead. Finally time to take a look and listen. I don’t believe I’ve ever heard of him. I love the sound. Mysterious is intriguing. I can do without the dancers, just as I could in the Fort Wayne video. Leave the dancing to the stoned audience members. A few years ago I saw a picture of Buckethead. 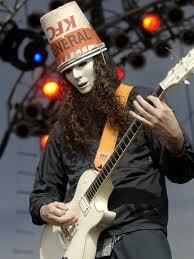 I laughed and thought ” what a chucklehead.” I got out of myself one day and viewed a few youtube videos of Buckethead. I was floored and intoxicated by Buckethead’s guitar work. His melodies and sheer guitar shredding style stayed in memory. I have purchased many CDs of his music online since. I recently saw Buckethead and That One Guy live in Madison,Wisconsin. As far as the mask and bucket, I enjoy the charactor he plays. As far as his personal life or “deep, troubling issues” – I will not judge. I have not met a person who does not have any issues in his/her life. I met many who claim not to have any problems. But then they never look into a mirror. Hee Hee, I even thought I was perfect, until I sobered up. As a Buckethead fan for several years now, I feel like I have learned so much about such a mystery. Originally drawn in by the shred and skill of the player (I was going through a “I wanna play fast” phase), I actually felt like it was the first time I had heard music. Not to discredit any artists I had been presented before, but Buck’s music truly because an inspiration. He has an endless amount of musical knowledge, and while taking advantage of this knowledge, he also chose to throw us some songs that broke out of musical theory. He has played every obtainable genre through just his guitar and has done it with a strange style. I feel like he is the only artist that I can listen to and actually feel like I’ve felt some of the same joys and pains as him. I also believe he has mental stability, but I also believe he is a genius. Now, genius’ have to be a little insane in order to be a genius. He tried very hard in his youth to disguise any sanity and tried to give the audience a psycho. Why? Maybe he had some insecurities and just wanted attention. However, in his more recent years, he has calmed down. He has always been a nice guy though. At every show, even when playing with GNR, he had to give his audience toys. These toys are of no worth to the audience, yet he knows that he has fans that would appreciate anything from him and stand by him as long as he was of the living. Thus, he chooses to give his fans something they would appreciate, along with allowing the fans to play with his guitar killswitch live, and even giving out signed guitars at shows. I know he has given out at least one signed Gibson Les Paul and several acoustic guitars. It’s sad though that many won’t appreciate his musical ability or be able to look past his persona. I can tell that he wants to be noticed as the best living guitarist out there, but chooses to keep his personal life a secret. He’s almost like a super hero, but sometimes I wonder if he wants to always be Buckethead, or turn back into Brian Carroll, but just can’t. Either way, the man is a true inspiration and a true musical virtuoso. God delivered the world a gifted man. Also, that first picture is NOT Buckethead as Buckethead has curly hair (not wavy), mostly only used a 1991 edition KFC bucket, and his rain coat was not zip up, but a pull over with a hood that he always wore. Wanted to post a quick “welcome” to Steve and Cameron. Appreciate your contributions! this picture is NOT buckethead, please remove it!!! Sorry ’bout that……. I had no idea. Why would they put an imposter photo up like that? Anyway, change made. Hope y’all like this one better.